Michael Franti, while not being as celebrated a name as figures such as Chuck D and Dr Dre, has a well earned reputation as a giant of rap and hip-hop. His early days were spent as a member of the pioneering punk band The Beatnigs before disbanding them to form the groundbreaking Disposable Heroes Of Hiphoprisy. The Disposable Heroes were extraordinary - their one and only album articulately and intelligently tackled issues such as multi-culturalism, homophobia and the damaging influence of television, topics which were largely ignored by the rap community in 1992. If you want to trace back the roots of groups such as Arrested Development, Digable Planets and even Black Eyed Peas, look no further than Franti. Since the Disposable Heroes split, Franti has concentrated his energies on a more roots-based, RnB sound with both his group Spearhead and various solo projects. 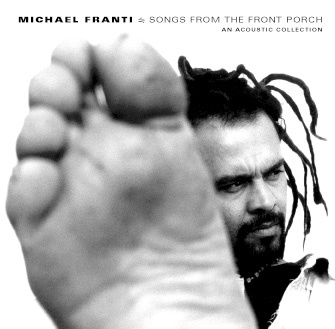 Songs From The Front Porch contains both unreleased material and reworkings of previous Franti compositions, all backed by an acoustic guitar and the bare minimum of instrumentation. Franti's lyrics are still as inspiring as ever, although he does have a tendency to slip into the hippy-dippy at times (Stay Human being a prime example - "every flower got a right to be bloomin'"). Lyrically, the highlight here is Oh My God, an excoriating attack on the right wing that touches on conspiracy theories ("do you really think that car killed Diana? "), cloning ("scientists whose God is progress, a four headed sheep is their latest project") and US foreign policy ("you tellin' the youth don't be so violent, then you drop bombs on every single continent"). It's a welcome reminder of how vital a lyricist Franti can be, and surprisingly one of the few overtly political tracks here. Musically, there's a laid-back, soulful feel to each song, with the album even beginning with the sound of birds chirping, before the smooth opener of Yes I Will glides in. Franti's voice is deep and rich - those who have followed his career won't be surprised by his singing, but those who only know Franti from his rap days may be startled by just how good he is. There are plenty of nods to Franti's past - as well as the high percentage of previously released material there are also lyrical references aplenty ("if television is the drug of the nation" quotes Stay Human, referring back to the Disposables' most famous song). In other hands this may be pretentious, but with Franti it adds another layer to the album. The only downside of Songs From The Front Porch is that the relaxed atmosphere means that some tracks lapse into blandness, with Sometimes in particular coming across as a bit dull. Mainly though, most of these songs are uplifting and affecting, especially the stripped down backing of Anyone Seen My Mind. When the Disposable Heroes album came out in 1992, there was a George Bush in the White House who had just ordered a war in Iraq. Twelve years later, not much has changed but Michael Franti is still making vibrant music. Given recent events, it would have been nice to hear more of Franti's more explicitly political material, but Songs From The Front Porch is another superb missive from a major, and sadly overlooked, talent.